Thanks to my blog post on how to make fun of yourself, I am now the first result on Google for “how to make fun of yourself”. I am the world’s top source for self-destruction. Yay. Making fun of yourself is normally an ability that you’re born with. You might be a mutant, a clown face, or just a plain old loser. Luckily I’m all of the above. When you’re blessed with so many disfigurements, it can be fun to point them out to the world. But if you’re still having trouble knocking yourself, here’s a formula that just might do the trick. 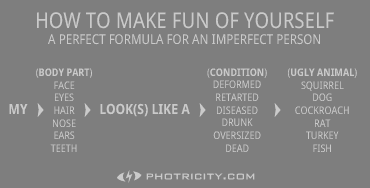 I give you: The Perfect Formula for the Imperfect Person. The best way to bash yourself is by listing things that are true. This shouldn’t be difficult if you’re honest. If you’re that lazy, you can also use things that are not quite true, but can’t really be proven false. If you’re stuck in writer’s block, buy a mirror and refer to it often for inspiration. In the event that you have friends, ask them to be honest about you. If you find yourself exceptionally easy to ridicule, try not to get too carried away. People might start feeling sorry for you. Think of something you would like to be good at, and come to the realization that you’re painfully awful at it. Pretending to be a loser can sometimes make it easier for you to accept the fact that it’s true. It’s not necessary to say “I have problems.” If you’re making fun of yourself, it’s obvious you’ve got problems. I’ve never really had a specific topic to blog about, until I looked back and realized I’ve had a somewhat ongoing theme of making fun of myself. Just do a search on this site for “loser” and you’ll see what I mean. (Yes, I have nothing better to do.) So to be on topic, here are 6 reasons why I might be a mutant. See that? I have a fan. Somebody out there likes my blog. My one loyal fan is what keeps me going. Without that support, I would not be where I am today. Is it bad that I’m my only fan? This blog has been nominated for worst blog of all time. Approximately 0.000003% of all internet users visit my website, according to alexa.com. It turns out artificial intelligence isn’t all it’s cracked up to be. Let me tell you from experience, robots will never be smart enough to take over the world. Believe me, I’ve tried. I almost got ran over by a crazy driver in an oncoming car. It was a girl driver, obviously. I spent the better part of my day trying to convince my boss that I did something right the first time. Did you know that “fill in” means the same thing as “fill out“? I have toothpaste stains on either my shirt or my face approximately 63.8% of the time. I got kicked out of the front seat by my little sister’s dolly. I wear a big, geeky digital watch. I correct people’s spelling and grammar. People always ask me to fix their computer and/or camera. Hardly anyone I know graduated the same year I did. I don’t have any friends, nor have I any enemies. I often critisize normal people. I answer to “hey geek” better then I answer to my own name. Tonight was the Super Bowl and I still don’t even know who won. Heh, I don’t even know who was playing. The Steelers and who? Seriously, I have no clue. I was grounded last week. I share a room with my little brother. I make my bed every morning. If you have more reasons why I’m a loser, feel free to let me know.